This book, set in the 1950s, takes us from small town Ireland to Brooklyn in the company of Eilis Lacey, a young girl forced into economic migration through lack of employment and the expectations of her family. Though told in the third person, we see through Eilis’ eyes as we get to know about her life in Ireland with the mother and sister she loves, with friends and roots in a community she has known all her life; then we follow her as she is transplanted to Brooklyn, where she has the support of the Irish community, still strongly under the sway of the Roman Catholic church, but where she is so far away from her family, friendless and emotionally alone. You can read the full book review by clicking here. I’m going to start by saying I think this is a wonderful film that gets Tóibín’s quiet emotionalism and gentle humour perfectly. The acting is brilliant all round and Saoirse Ronan’s central performance as Eilis Lacey thoroughly deserves all the awards nominations it has received. It’s beautifully filmed. 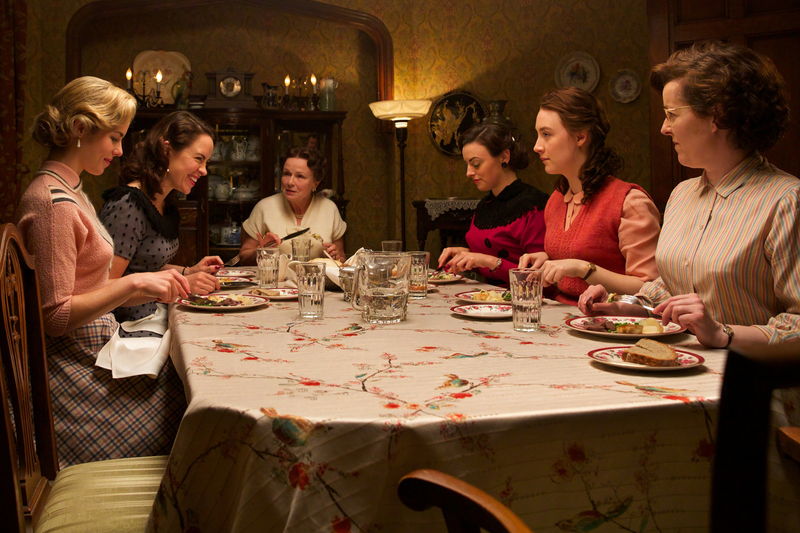 Although I understand most of the Brooklyn scenes were actually shot in Canada, they nonetheless feel entirely authentic, but the Ireland scenes are fabulous, showing to full effect the gorgeous scenery and lush greenness of the Emerald Isle. It’s a special treat that some of the scenes are shot in Toibin’s own birthplace of Enniscorthy, the place where so many of his novels are set. However, this slot is all about comparison and, although the film sticks very closely to the plot of the novel, for me there were some significant differences in emphasis that somewhat changed what I thought of as the central themes. 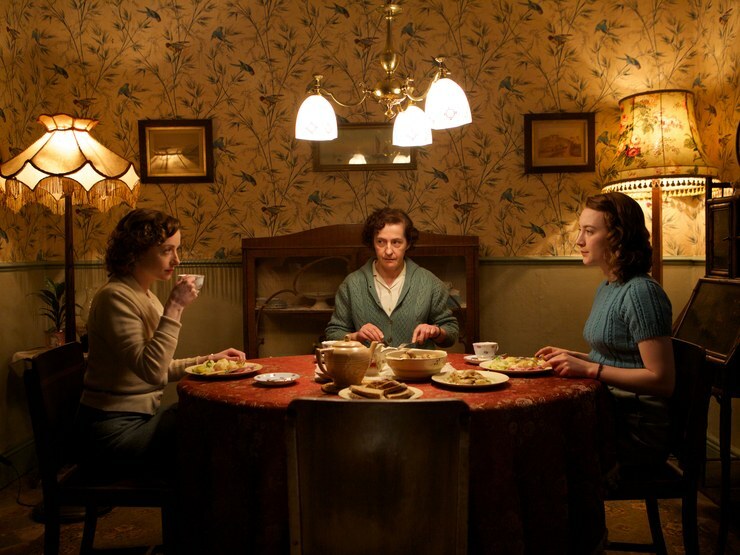 There are four things in particular that I feel change the interpretation – the speed with which the film gets her to Brooklyn, Eilis’ family, the love affairs and, most of all, Eilis’ personality. In the book, much more time is spent in Ireland before Eilis boards the ship for America, during which we see her as having very little say in her own future. It is the 1950s, opportunities in Ireland are scarce and many of the young people are forced away from the country to look for employment. Eilis herself, however, doesn’t want to go and isn’t consulted when her sister and mother decide what is best for her. It gives a real and believable picture of a society where young people were still expected to conform to decisions made for them by parents and community, before the rebelliousness and individualism of the sixties had begun. The film, constrained no doubt by time, hints too quickly at this, thus missing some of the deep sorrow of forced migration. It feels as if Eilis is going to America to look for opportunity, rather than going from Ireland because of lack of opportunity – a subtle difference but, I felt, an important one. The wonderful Julie Walters is on fine form as Eilis’ landlady in Brooklyn, Mrs Kehoe. In the film, the love affairs are central – in the book, I felt they were less so. The focus of the book is on homesickness and the gradual creation of a new life. Obviously, Tony, the American love interest, is part of that, but Eilis is not bowled over by him the way she is in the film. Again the differences are subtle, but Eilis almost clung to Tony because of her loneliness and one was never quite sure of the depth of her feeling towards him. The same could be said about Jim – his plot purpose in the book was not to rend her heart between two lovers, but to provide a way for her to stay in Ireland. The differences are subtle, of tone rather than of story and, as always, come down to a matter of personal interpretation. None of the above should be seen as criticism, however. It is merely a comparison. 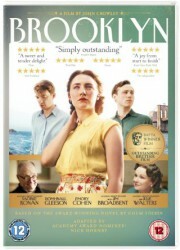 I repeat – a brilliant film that gets my highest recommendation! It is those subtle, but real, differences that can matter so much, FictionFan. A lot falls out from what seem like meaningless differences (to rather than from, for instance). Those things really do give the book its tone, and if the film treats them differently, that carries over, if that makes sense. Still, it’s nice to hear that you thought the film was well-shot, well-acted and so on. Excellent discussion as ever. Thanks, Margot! 🙂 Yes, it was interesting to see how closely the film stuck to the story including a lot of the original dialogue, and yet changed the tone. The reason the book usually wins, I suppose, is that films don’t allow the same amount of time for subtlety – they really have to tell a good story, and an inconclusive ending that might seem beautifully ambiguous in a book can be annoying in a film. Having said all that, this is still one of the best adaptations of a ‘literary’ book I’ve seen. Now why am I not surprised that the book makes the best cut! I do think, however wonderful a film may be, as the best books stand or fall, in the end, by the quality of THE WRITING, few films are going to be able to equal the power of that (in a really well written book) Inevitably, subtleties must fall from a film, because the forward momentum of them means you can’t meaningfully pause to think about something which puzzles, moves, inspires you. Something which is magical about reading, I think. That ability to be shocked, gobsmacked, reduced to tears, and all the rest. You can put the book down, sob your heart out, shout at the perfidy of a character, etc etc, digest all that, and then resume the forward momentum. I am enjoying this book or film project of yours! Yes, I think sometimes crime or action novels can gain from adaptation, but lit-fic is much harder for the reasons you give. Also simple time restrictions often mean that changes must be made – for example, dropping the brothers in this one and cutting back on the pre-Brooklyn part of the story. There was a little interview with Toibin on the DVD in whic he said he thought Nick Hornby’s script had caught his meaning exactly. That left me a little discombobulated, since I didn’t! But I felt that either he was being rightly polite (the script is excellent), or perhaps a lot of what I saw in the book I put there myself – I think that’s also one of the joys of lit-fic, that it tends to be a collaborative effort between author and reader. Well you will have to carry on doing it for me, by my popular request. 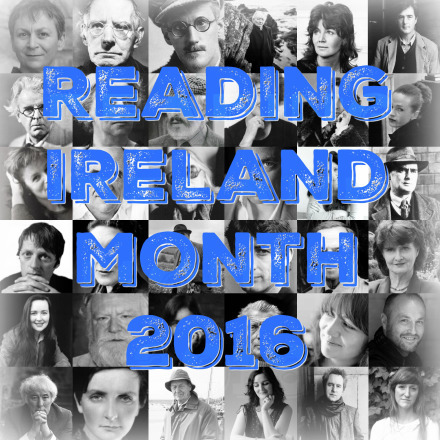 Indeed – and I think with someone like Toibin who seems to write very much with an autobiographical slant, he may well not be aware of how much he reveals. I only really became aware of the collaboration when I started reading reviews and seeing that other people were interpreting things quite differently, sometimes just a little, but sometimes totally. Like when I read The A26 as a metaphor for post-war France, and no-one else in the entire world seems to read it that way… sometimes I worry myself! Having seen the film (really enjoyed it), I’d love to read the book now! The subtlety you describe makes the book seem very powerful. This is one on my TBR, FF — and it sounds as if the movie, too, should be a must-see. Thanks for laying out the subtle differences between the two. I’m glad to hear they didn’t completely mar either one from being enjoyable. Hard to realize that things have changed so much in what’s a relatively short period of time, though. Can you imagine being banished from family and country, alone?? Oh, I LOVED this movie and I did wonder how it differed from the book! Very interesting…. I must say I was torn on her return to NY. I could have easily seen her staying in Ireland, which led me to wonder about her premature relationship in America…(don’t want to include too many spoilers here). I might have to read the book, after all, to get the full effect of the beginning in Ireland. HahahahahahaHA!! Oh I’m so glad to read that, because I’ve been so worried you might all feel a little cramped in the refugee camp I’m building in my garden…! It cannot happen! It just can’t! Great analysis on the differences between the two forms. 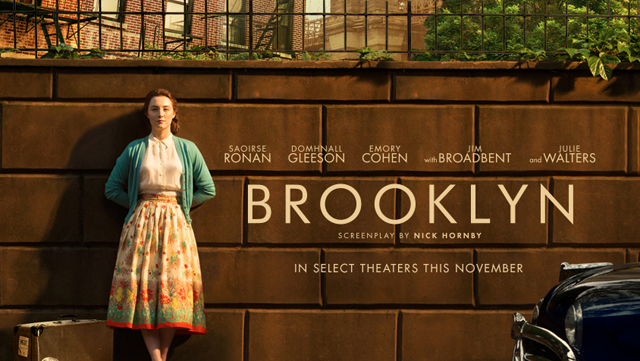 As film adaptations go, Brooklyn is definitely one of the most sensitive I’ve seen in recent years, but it’s difficult to recreate the same context on screen. As you say, sometimes the changes are quite subtle but they can make a difference. Interestingly, I went to see the film with a friend who hadn’t read the novel (I had), and she didn’t quite buy the final section, possibly for the reasons you’ve articulated in your penultimate paragraph. I could reach back to my reading of the novel, whereas my friend didn’t have that context on which to draw. She’s going to read the book at some point to see if that makes a difference to her impressions of Eilis. I’ve read the book but not seen the film – the right way round, I always feel. I must make a point of watching this one. great review, and I didn’t feel there were too many spoilers. Great review. Interesting your thoughts on the difference between the two. Personally I preferred the film as the Ellis in the book just annoyed me. I’m not entirely sure about you point regarding her brothers only being in England so her mother not being as isolated in the book as it appears in the film. Despite the geographical proximity it was not unusual for men in particular to disappear to England never to return. They often worked low paid cash in hand jobs so couldn’t afford to come home. Additionally socially isolated, with no homes and no one to care for them they spent a lot of time in pubs. Many became alcoholics, and we’re ashamed to come home. English cities are full of old people who went over in the 40s and 50s and have lost touch entirely with their families. Thank you! 🙂 In truth, I thought the film was a better film than the book was a book, if that makes sense. I also had problems with Eilis’ passivity in the book, and I thought the ending felt contrived. The film Eilis was much easier to like. But I did think the book had more depth and subtlety – time restrictions often mean films lose out on that. You’ve made me want to go and watch the film all over again. I did enjoy the book and the first part in particular, and completely agree with you about the sense of homesickness that is so well written. In the end, though, I thought the film carried it, although perhaps more for the acting of S R and the beautiful way it was shot – you really felt as though you had somehow fallen back through time in every shot. Did enjoy reading your review! Aha! The book prevails! Three cheers for the fine print! I haven’t read the book or seen the film although I plan on doing both – despite that I read the whole review because I fortunately have the memory of a goldfish and a TBR the size of infinity so guess I’ll have forgotten the points you make by the time I get around to doing either. The reason films disappoint me so much is when they alter the overall tone of the book, in this instance the set up of the family seems like this was a ‘cut’ too far perhaps? I’m definitely checking out the movie now, a different tone could bring new insight. I definitely want to read the book before seeing the film. This whole review is spot on. You’ve pointed out several more differences between the two versions of the story than I had noticed, and I can’t disagree with any of them. Nor would I quibble with the overall take: It’s a terrific film, and a nearly terrific book, and I’ll take the book over the film. But I like books better than films, just generally, and read much more than I go to the cinema. Somebody ought to make a film of The Testament of Mary, and stick to the book rather than the play script. There would be plenty of room for everything. Thanks, Matt. 🙂 I probably wouldn’t have noticed any differences if I hadn’t been planning to review it. I’m not an overly enthusiastic movie-goer myself and if I watch a film at home, I’m incredibly bad at concentrating on it. So this reviewing business is as much to make me pay more attention to what I’m watching as anything else. And the book always has an unfair advantage as far as I’m concerned, except maybe with sci-fi, where special effects can make all the difference. 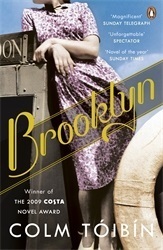 But yes, both book and film are great in this instance, even if Brooklyn isn’t my top favourite Toibin book. Doing this comparison definitely made me appreciate the book more, though. Love your work, FF. I confess I haven’t read the book, but I loved the film, largely because it told a different sort of immigration story, one in which grief and loss were tempered by excitement and opportunity. I also read the story as an allegory for Tóibín’s own life: as a gay man growing up in Ireland, visiting New York must have been so liberating. Thank you! 🙂 Yes, I think that was very much the tone of the film, but maybe a little less so in the book – there was a bit more ambiguity around the ending in the book, I felt. Definitely one I recommend reading, though – I think this is a rare case of the book and film complementing each other. Ah, I thought the film was excellent. This must have been quite a difficult decision to make. But I’m glad to hear the book is even better than the film. The written word wins out once again! The book always has an unfair advantage with me, since I’m not really a huge film fan on the whole. But I loved this film – the casting was great! Well, I’d better get reading the book so I can finish it before the film moves on from a local cinema where it’s currently showing. Your review has prompted me to make it the next book I pick up. Oh good! I hope you enjoy it! Loads of people have loved the film without having read the book first, but I do feel that knowing the extra depth of the book enhanced the film watching experience for me. Do let me know what you think – of them both. 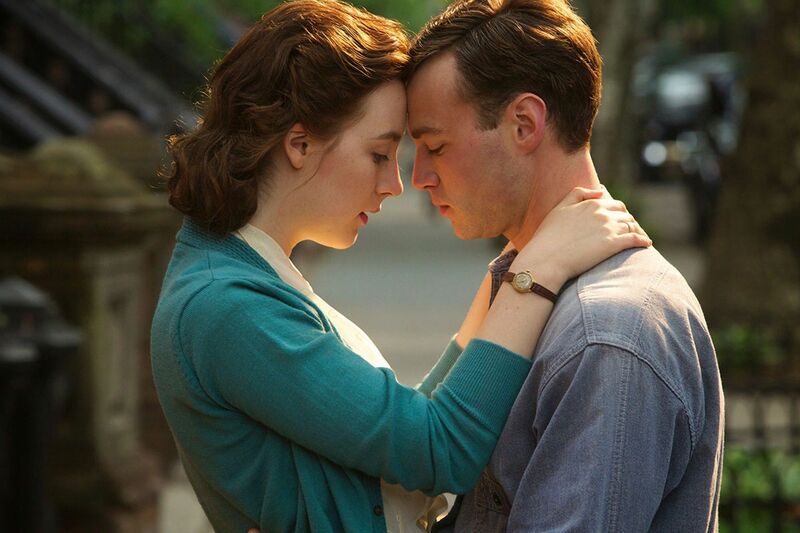 Well, I did read Brooklyn and then Nora Webster. I am so taken by Colm Tóibín’s quiet, warm storytelling that brings the reader right into Eilis’ world. And then, a short period of unwellness meant that I missed the film showing, so I’ll have to wait for digital access. Friends and family have recommended it, so I really want to see it sometime. I’ll look forward to reading our review once I’ve read the book or watched the film. The book again! Why…you bookaholic, you! Some films are bound to win. I actually do like her green coat up there. I might wear it. If it had pockets on the inside, that is. Great colour! And you could get a matching brown beret too – that would make you look very rakish, and French! I know that a beret is a hat. So I’m good there. Rakish…is that good? Rakes! Then I shouldn’t be a rake, you know. Just the other day this chap (much older than me) asked if I had a girlfriend. Can you believe that? *bangs head* Cassie!! *laughs* What the heck WERE you listening to?? You know, I don’t even know! Sometimes I’ll put on a song or something on Youtube, and it will just keep going through songs and whatnot. it was awful. Oh no. I’m quite protected from that sort of thing. I’m like a steel beast or something like that. There you go, Cassie was your typical…girl! John McClane fell in love. James Bond falls in love all the time! Even Hector fell in love!! There’s no hope for you, I fear… *gasps* How dare you!! That’s like saying Evan is your typical boy!! Aha! You know the pain, then. James Bond is a womanizer! He’s not a hero at all, I’ve decided. *nods* Hector…he had a wife…that’s different!! There is hope! The tree of Gondor has a flower on it, after all. Evan was an alien, tho. Doesn’t count!